﻿ So is the book Jumping Jenny intended to bring back the pogo stick? Not really, but I do think they’re really fun, and definitely great exercise, so why not? If every manner of hula hoops have made a comeback at outdoor rock concerts around the world, maybe there’s hope for the pogo stick. 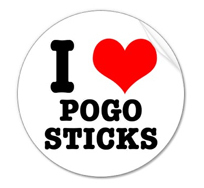 So I teamed up with a great partner, American Pogo Stick Company, who has graciously offered to do pogo stick and digital counter giveaways to celebrate Jumping Jenny! I just scored a beautiful new Foam Master pogo stick and digital counter for myself- so I can get in shape for my author visits!!! Anyone who comes to an event in March can enter to win a new pogo stick and counter for themselves. Stay tuned for more contest and raffle details. Of course, helmets and other protective gear are strongly recommended. But who came up with the pogo stick in the first place? As legend has it, while traveling in Burma, an American named George Hansburg met a poor farmer who created a jumping stick for his daughter, Pogo, so her shoeless feet could navigate the mud and rocks on her way to temple. Hansburg liked the idea so much, when he got home, he created a jumping stick of his own, with the addition of a spring at the bottom for bouncier trips. Speaking of bouncier trips… imagine jumping 42 inches off the ground, without really trying. A trip on the Bow Go will get you there. By replacing the metal coil spring of a conventional pogo stick with a fiberglass bow, Carnegie Mellon University researchers have turned the bouncing toy into a jumping machine. The device, which they call a BowGo, thus far has been able to clear obstacles as high as 42 inches. But you may be asking why bother. Well, in addition to the joy of jumping up and down with greater voracity then you could with your own two feet, the Pogo Stick has many health benefits. Learning to jump requires balance and may take a bit of practice. The continuous act of balancing works on core muscles. Building these muscles is much like applying an internal girdle, which results in a stronger back and flatter stomach. Using a pogo stick builds strong leg muscles as well. And needless to say, the cardio workout you get by jumping on a pogo stick is great for the heart, and waist.